As a district manager or school manager, use the Import feature on the Students page to add large numbers of students into MySciLEARN at one time. For example, at the start of the school year, you could use this feature to mass import all of the new students at your school or district into MySciLEARN and create assignments for those students. To add an individual student or small numbers of students, see Add, edit, and delete students. If your students already exist in MySciLEARN, see Update students from a file to learn how to update large numbers of students. District managers can always access this feature. School managers can access the feature when using the default permissions for their role. Instructors cannot see the Update/Import button and cannot access the feature. Importing students from a file includes three steps. 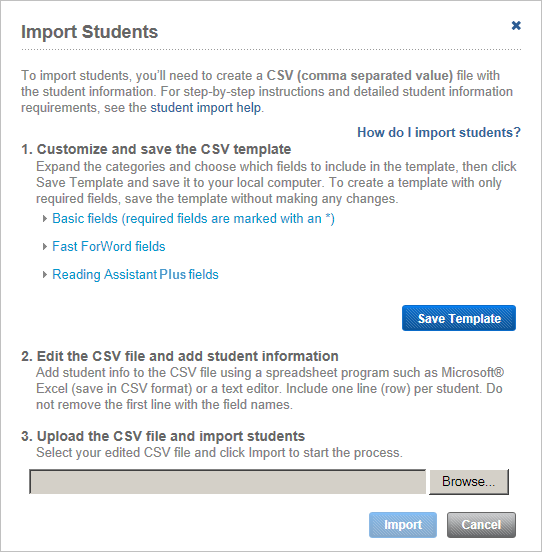 The first step in the import process is to create a CSV file that includes the student information you plan to import into the system. A CSV file (sometimes called a comma-delimited file) uses commas to separate student information into columns and fields, and uses lines (rows) to separate each individual student. MySciLEARN uses a CSV file to add the student information to our system and create the students. You can use MySciLEARN to generate a CSV formatted template file (easier), or you can use your own CSV file (advanced). To simplify the import process, MySciLEARN lets you generate a CSV template file that meets our import requirements. This is the easiest way to import your students. However, if you already have your own CSV file, you can use that file instead—see Create your own student import CSV file to learn more. Log in to MySciLEARN as a district manager or school manager and in the Manage section, click the Students tab to access the Students page. Click the Update/Import button at the top of the page. If you cannot see the Update/Import button, you do not have permission to access this feature. On the Update or Import Students screen, click the Import button. On the Import Students screen, expand each of the categories (Basic Fields, Fast ForWord Fields, Reading Assistant Plus Fields) to review the fields you can include in your template. Each field corresponds to specific student information. Fields with an asterisk are required and must be included in your template (they cannot be deselected). For a definition of each field see the tables in Step 2 – Add student data to CSV file. If needed, add additional fields to your template by checking the box next to those fields. To generate a CSV template with only the required fields, skip this step and click the Save Template button without making any changes to the categories. Tip: If you plan to create assignments for your students, you must include the “Assignments” field in your template (under Basic fields), which is not selected by default. Click the Save Template button and follow the prompts to save the file to your local computer. If your browser asks you to choose between opening and saving the file, choose to save the file. If you choose to open the file, it may not be generated properly and will require that you generate the CSV file again. Advance to Step 2 – Add student data to CSV file. Create a student import CSV file from your SIS. Many districts and schools use student information systems that allow you to export student data in a CSV formatted file. See your SIS documentation for steps. Use an existing MySciLEARN import CSV file. If you’ve already created a CSV file to import students (for example, for last year's implementation), you can use that file again to add any new students. When using your own CSV file, you'll need to edit the file to conform to our expected format. You'll also need to add a header line to your CSV file that includes the correct MySciLEARN header names. Follow these steps. To learn more about formatting requirements see Step 2 – Add student data to CSV file. Generate a new CSV template that includes the fields you want to include in your CSV file (see Generate a CSV import file). Either copy the template header into your CSV file or copy your student info into the template below the header line. Use a separate line (row) for each student. Do not include students who already exist in MySciLEARN. To update existing students see Update students from a file. Enter data in all of the required fields for each student or the file will not be accepted. Required fields are marked with a red asterisk in the following tables. Make sure that the information in each field conforms to the required format and does not include invalid or extra information (such as a school that does not exist). If you're using your own CSV file instead of our template file, add a header line (row) at the top of the file with header names that conform to the required format. Use these tables as a guide when formatting the CSV file. Unless otherwise indicated, only use the following characters in the file: alphanumeric, spacebar, minus sign (as a hyphen), underscore. An ID assigned to the student by school staff. Must be unique across the district. The organization ID for the student's school (listed on the Schools page in MySciLEARN). To use this field, you must have access to the school. The name of an existing instructor that you want to associate with the student. The name of an existing group in which you want to enroll the student. If a name includes a comma or an ampersand (&), precede that character with a backslash (\). Example: 1st \& 2nd Period Lab. For multiple groups, use an ampersand (&) with no spaces or backslashes to separate group names. Example: Fall 2010&After school. If left blank, the student will be enrolled in the default group. The student's username for logging in to MySciLEARN. Must be unique across the district. If left blank, a username is automatically generated unless you enter a password; in this case, you must enter a username in this field. The password for logging in to MySciLEARN. 5 to 25 characters only (not case sensitive). If left blank when required, a password is automatically generated. Leave this field blank to use Fast ForWord Auto Assign or Reading Assistant Plus Auto Assign. 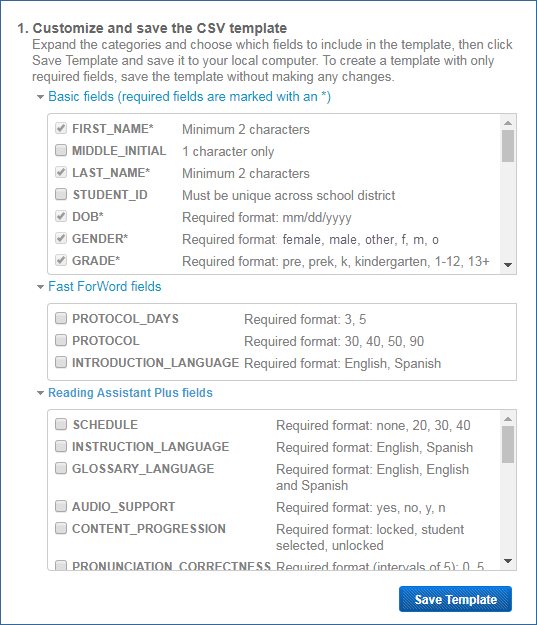 You may be required to enter additional assignment information in the Fast ForWord fields or the Reading Assistant Plus fields, if you want to customize the assignment settings. Otherwise, the default settings will be used. With per student licenses, the school must have an available license for the student or that student will not be added. See About licenses. These fields only work if you have entered a manual Fast ForWord product assignment in the Basic fields section. If you are using Auto Assign, any values in these fields will be ignored. Tip: If you are using Fast ForWord Auto Assign, you can set these default options at the school level first. This way, any new students you import here will use those settings automatically. See Set Fast ForWord school defaults for steps. Library includes High/Low selections if the student is in 6th grade or higher. Library will be automatically updated when new content is released. Library is not published, and can be edited by instructors as needed. The rest of the assignment settings can be customized in the CSV file as follows. Strictness level when evaluating student pronunciation of a word, where lower = less strict, higher = more strict. If left blank, defaults to 50. The measure you want to use to create a library for the student. Leave blank for Auto Initial Assignment. Upload the CSV import file you created in the first two steps. Under Step 3 on the Import Students screen, click Browse (or Choose file, depending on your web browser), navigate to your CSV update file, then select it. If no errors occur, continue with step 5. If the system detects any problems with the information in the file, it shows an error message on the Import Students Summary screen. To access a detailed list of all errors in the file, click the download error file link. Then you can correct the errors in the import file and return to the first step in this task. On the Import Students Summary screen, click Confirm Import to import the students. A message appears when the import is complete. If you are importing large numbers of students, this may take a few moments. If your file does not include any errors, all of the students in the file are imported into the system. If your file includes student rows with errors, those students are skipped during the import process. Follow the instructions to view a comprehensive list of errors. If needed, you can save that error list as a text file on your desktop, or copy and paste the error list into a text file. Correct the errors and try again. Close the success message to end the process. The students are added to the system. If you are not using Auto Assign and you did not create assignments for your students, you'll need to create assignments for them. See the following topics for steps. Otherwise, the students can start immediately start training.